Framed within a setting of the aftermath of the Japanese tsunami in 2011, a Russian emergency response doctor who speaks German, calms a group of German students trapped under rubble with a story of his five fathers. The doctor's mother has told him the story of his 'five fathers' who she met during the siege of Stalingrad in 1942 when the warring madness of rival dictators collided with their respective Russian and German armies in the city of Stalingrad. When an elite group of Russian scouts arrive in Stalingrad, they meet Katya (Mariya Smolnikova) a native of the city still clinging to her pre-war world as it crumbles around her. 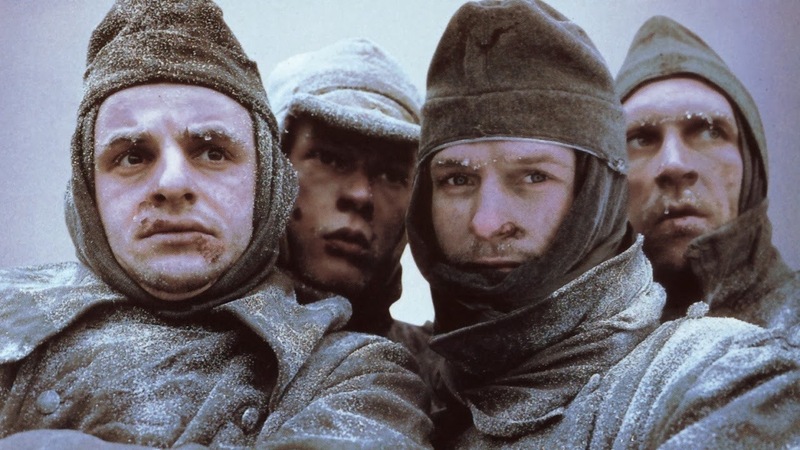 Led by Kapitan Gromov (Pyotr Fyodorov), this small squad of war hardened - an understatement if ever there was one - soldiers are slowly reminded of their individual humanity by the presence of Katya being amongst them. The theme of struggling for one's humanity is also considered through the German Kapitan Kan (Thomas Kretschmann, Wanted, 2008). Kan has become fixated on Masha (Yanina Studilina) a Stalingrad native who bares a remarkable resemblance to his German wife. The war forces all of the male characters towards 'man's inhumanity to man' with ideologies and orders battling with basic humanity. Stalingrad shown in IMAX (which one can but be urged to experience the film in) is comparable to the opening twenty minutes of Saving Private Ryan but with that intensity on steroids turned up to maximum and for nearly 80 of the film's 131 minutes. The film is extremely visceral and personal in it's violence at all times reminding us that it was people who fought this war not nameless drones. However, the film also has the nuanced nature of a fellow Stalingrad set film, Enemy at the Gate. As the structure of the film reveals itself, we are given time and a real sense of connection with the characters without recourse to stock stereotypes for the leads. A visual and emotional roller coaster, Stalingrad is rightly not for the faint hearted and does not at any point glorify war. Instead, it humanises a particularly dark point in our recent history by means of outstanding direction and film making.